We wrote the book on it. Our firm's experience in Branson Nightly Rentals is unmatched in the area. Jeramie Worley and his team have not only been selling nightly rentals, but many of them are owners and operators, so they can speak with conviction on what works and what doesn’t. 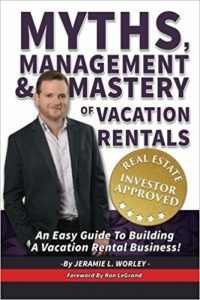 This puts you at a huge advantage when buying or selling a vacation rental in Branson or the surrounding area. We do not have a property management firm, and we don’t manage the rentals. We only help you buy and sell them. So, if you are a property manager and you want to refer your clients to us, we will send them back to you to manage the property. That’s a good thing. Jeramie is the founder and President of the Missouri Vacation Home Alliance (link), a statewide advocacy group for Vacation Rental Owners and Affiliates across the state of Missouri. He works hand in hand with lobbyists and state legislators to ensure that we have a say in the laws that are being talked about in Jefferson City. Not all areas allow nightly rental in the Stone, Taney, Christian, and Greene County Areas. Let us help you understand the process so you can make sure you will be able to use the property the way you want to. Tracey is an amazing realtor! She went above and beyond to help me get my vacation rental in Branson West up and running. She has a fantastic personality and a great knowledge of the area and I couldn't have gotten this part of my business going without her! I highly suggest ANYONE use her as their realtor, whether for investment purposes or for home buying! Truly a realtor to trust!! Jeramie, Tracey, and their team are great to work with when buying and selling homes. I am a full time real estate investor in Branson, Missouri and am glad to have this aggressive and honest team of realtors on my team! Thank you! We had the pleasure of meeting Jeramie and Tracey by chance when we were in town looking at investment properties. From the moment we met with them we knew we were in good hands and they would not steer up wrong. It took us nearly a year to find what we were looking for, but Tracey stuck with us and was so patient. We felt she and Jeramie had our best interests in mind and helped us navigate through some difficult decisions. We will always use Worley and Associates for all our MO real estate needs!! Share your info below to arrange a consultation about investment properties.